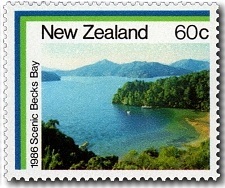 Virtual New Zealand Stamps: 1985 - 1986 Scenic Stamps. 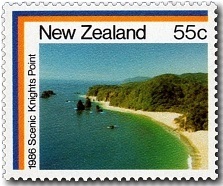 1985 - 1986 Scenic Stamps. 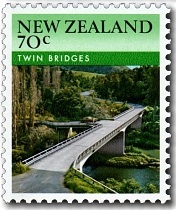 1985 Scenic Stamps - Bridges. See the full collection Scenic Stamps Series - Part One. The landscape of New Zealand means there are many rivers and other obstacles that needed to be crossed by both roads and railways. 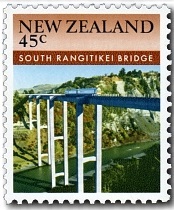 The 1985 Scenic Issue shows just four of these many hundreds of bridges. 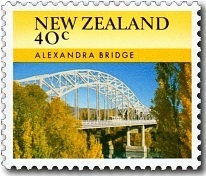 What can be seen in these four stamps are examples of technology and variety of designs found in New Zealand's bridges. 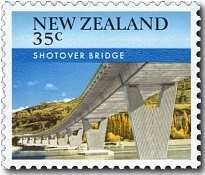 35c - Shotover bridge. 40c - Alexandra Bridge. 35c - Shotover Bridge, Central Otago. The Shotover River was once one of the most riches gold bearing rivers in the world. Today the upper reaches is mainly used as a tourist attraction for white water rafting and jet boat tours. The road bridge across the Shotover River in Central Otago, lower down from the tourist operations, was described at its opening in 1975 as "mathematical precision combined with beautiful form". The two-lane carriageway is 320 metres long and is made up of 169 pre-cast, pre-tensioned concrete box girder sections. 40c - Alexandra Bridge, Central Otago. 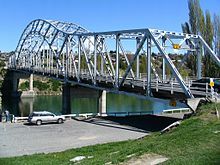 Steel was the chosen material for the bridge built over the Clutha River at Alexandra in 1958 to replace a bridge built in 1882. Spanning some 158 metres the new tied-steel arch bridge incorporated special design features. It is anchored to one abutment by means of a hinge and there are bearings, or rollers on the other abutment and all the piers, that allow the bridge to freely expand and contract. State Highway 8 bridge, Alexandra, New Zealand. It you look at the photo above you can see how the box-truss spanning the road is joined to the arch-span over the river. Some very clever and unusual engineering. 45c - South Rangitikei Rail Bridge. 70c - Twin Bridges, Whangarei. 45c - South Rangitikei Rail Bridge, Central North Island. The South Rangitikei rail bridge forms part of the main trunk railway line north of Mangaweka in the central North Island. Because of the danger of flash floods and earthquakes the bridge is able to move and in the event of an earthquake the legs of the high slender piers are designed to alternatively lift off their foundations. During construction, on the 6th May, 1975, a newly-poured span of the South Rangitikei rail bridge on the Main Trunk line at Mangaweka, collapsed sending 100 tons of concrete crashing into the river gorge. 70c - Twin Bridges, Mangkahia and Awarua Rivers, Whangarei. An unusual bridge located at the confluence of the Mangkahia and Awarua rivers in Whangarei county, Northland, is the subject of the fourth stamp. Twin Bridges takes its name from two bridges built there in the 1920s. These were replaced in 1970 by a single reinforced concrete structure but the name remains. A feature of the new bridge is a 19 metre landing which branches off to give access to farm land which would otherwise be isolated by the convolutions of the two rivers. 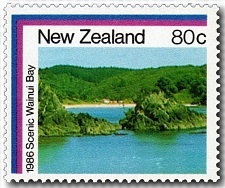 1986 Scenic Stamps - Scenic Coasts. A favourite subject of the many New Zealand Scenic stamps has been coastal scenes. New Zealand has a long coastline that includes an endless number of scenic localities. 55c - Knights Point. 60c - Beck's Bay. 55c - Knights Point, West Coast. A favourite lookout spot on the southern West Coast of the South Island. Beneath the point the bush slopes steeply to a golden sand beach and in the water itself are interesting pinnacle shaped rocks. I found this interesting story. Construction of the road from Ross south to Haast began at both ends with the construction teams meeting at this point at this picturesque place on the coast. As the time for the official opening of the road drew near, officials from the Ministry of Works journeyed to the meeting point to make arrangements for a commemorative monument by the roadside. In the course of conversation with the construction crews, it was mentioned that the location should be named after a senior official of the Ministry of Works employed in the head office in Wellington, the national capital. The construction crew informed the delegation from Wellington that the area had already been named Knight's Point. The officials inquired who "Knight" was and were informed that he was the surveyor's dog. Apparently Ministry of Works documents indicate that Knight's Point was named after "the obscure dog of an obscure employee of the Ministry of Works." 60c - Beck's Bay, Marlborough Sounds. The Marlborough Sounds are an extensive network of sea-drowned valleys at the north end of the South Island of New Zealand. The Marlborough Sounds were created by a combination of land subsidence and rising sea levels which today has become some of the most beautiful scenery in New Zealand. An attractive view from the coast road from Picton to Havelock. One of the many attractive and secluded bays in the Marlborough Sounds. 65c - Doubtless Bay, Northland. 80c - Wainui Bay, Northland. 65c - Doubtless Bay, Northland. A large curving bay on the Pacific coast north of Mangonui Harbour, Northland. This region is noted for its beautiful scenery, warm climate and sandy beaches. 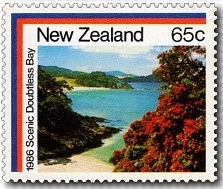 Doubtless Bay was named by Captain James Cook during his first voyage of Pacific exploration in 1769. Poor weather prevented Cook from entering the bay proper, though a number of Maori longboats put out from shore to come alongside Cook's ship Endeavour and sell fish to her crew. In the same year the bay was visited by Jean-François-Marie de Surville in his ship the Saint Jean Baptiste. In retaliation for the theft of a longboat which had gone adrift after his ship had dragged her anchor in a storm and narrowly escaped destruction, he carried off a Maori chief and set his village on fire. 80c - Wainui Bay, Northland. A small bay also on the Pacific coast of Northland. One of many sheltered bays setting a scene for recreational activities. 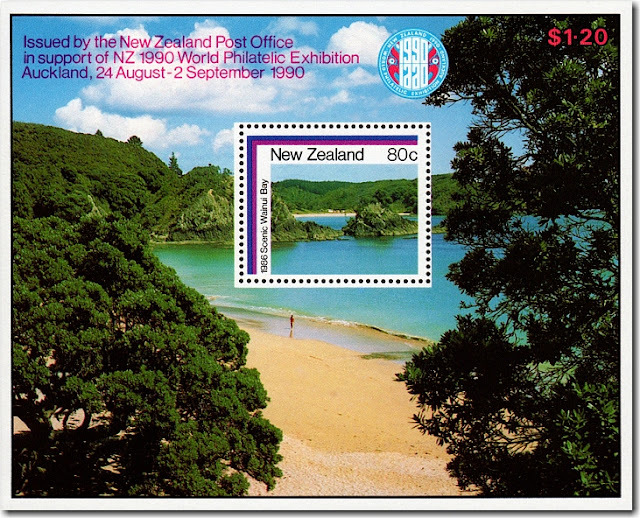 Incorporating the 80c Wainui Bay stamp the sheet was issued in support of New Zealand 1990 World Philatelic Exhibition, held in Auckland. The miniature sheet released with this issue was also produced with a Stockholmia '86 overprint to mark New Zealand Post's attendance at the Stockholmia '86 World Philatelic Exhibition in Stockholm, Sweden and for sale at the exhibition itself. I'm not sure I like the idea of overprinting one exhibition for sale at another. Technical information - 1986 Bridges. Technical information - Scenic Coasts. 1966 - 4th National Scout Jamboree. 1960 - 1966 Pictorials Part Five.